Women who smoke while they are pregnant may put their grandchildren at risk of asthma—this according to new research presented at the European Respiratory Society’s International Congress 2015 in the Netherlands. The Centers for Disease Control and Prevention (CDC) suggests that asthma affects eight percent of adults and 9.4% (roughly 6.8 million) of all children in the U.S. Evolving environmental exposures have been thought to be responsible, but researchers are now looking toward previous generations for answers. The study survey included 44,853 grandmothers listed with the Swedish Registry from 1982 to 1986. Smoking was recorded during the grandmothers’ pregnancies as well as use of asthma medication in 66,271 grandkids. Researchers discovered that children were at a 10%–22% increased risk of asthma if their grandparent smoked during pregnancy—even if their mothers didn’t. Lodge suggests that in order to properly understand the asthma epidemic, it is essential to know how harmful exposures in the present may affect future generations. She urges researchers to remember that there may be an inherited, non-genetic risk carried over from exposure in past generations. Lodge, C., et al., “Does grandmaternal smoking increase the risk of asthma in grandchildren?” presented at the European Respiratory Society’s International Congress 2015, Amsterdam, Netherlands, September 30, 2015. 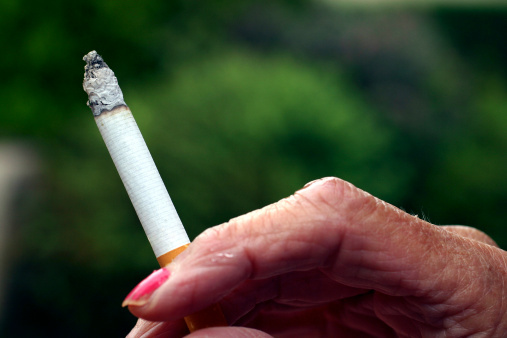 Brazier, Y., “Could asthma be inherited from grandmothers who smoke?” Medical News Today web site, September 30, 2015; http://www.medicalnewstoday.com/articles/300182.php.